1University of Sfax, Faculty of Sciences of Sfax, Department of Sciences of life. Research Unity UR/11ES72 Biodiversity and Aquatic Ecosystem. Street Soukra Km 3.5 - BP 1171- CP 3000 Sfax, Tunisia. Background: To investigate the structural diversity of the planktonic phytoplankton through summer 2009 and summer 2010, to identify the role of the main abiotic factors that determine the phytoplankton community structure and functioning and to study the summer spatial distribution of phytoplankton in relation to its potential predators such as ciliate and zooplankton. Methods: Phytoplankton and ciliate samples were analysed under an inverted microscope after 24 to 48 h settling using the Utermöhl method. Zooplankton enumeration was performed under a vertically mounted deep-focus dissecting microscope. Results: Our results demonstrated a striking difference among years is seen in suspended matter concentrations with lower values in summer 2010 (47.37 ± 23.12 mg l-1), contrasting with the higher suspended matter values in summer 2009 (92.88 ± 7.15 mg l-1). A total of 50 phytoplankton taxa identified during this study of three different algal classes (cyanobacteriae, diatoms and dinoflagellate). We found: first, in summer 2010, the phytoplankton abundance was about 3 times that in summer 2009, second, a high abundance of cyanobacteriae (43 % of total phytoplankton) and diatoms (54 % of total phytoplankton) in summer 2009 and 2010 respectively. In summer 2009, we observed a cyanobacteriae growth with dominant opportunistic and nitrogen-fixing Oscilatoria sp. Dominance of the benthic and large diatoms genus such as Navicula and Nitzschia has been reported in summer 2010. Concerning dinoflagellates, they were strongly dominated by mixotrophic and heterotrophic dinoflagellates species, like Polykrikos kofoidii, Ceratium lineatum, Protoperidinium steinii. Conclusions: This study indicates that the abiotic factors of the coast area around Kneiss Islands are associated with the spatial and inter-annual variations of the phytoplankton. The coast of Sfax is a part of the south-western Mediterranean sea and is located in southeast of Tunisia (Rekik et al., 2012, 2016). It is bounded by the Kneiss islands in the southeast, which is composed of four little islands with Bessila is the main island, Hajer island in the north, Laboua island in the centre and Gharbia island in the south (Gueddari and Oueslati 2002). These islands are uninhabited by human populations (Mosbahi et al., 2015). The Kneiss Islands represent the most important coastal wetlands in Mediterranean Sea, and make up a very important intertidal area exploited for clam harvesting by the local population (Mosbahi et al., 2016a). The archipelago of Kneiss, represent an important site in terms of fish resources and ornithological diversity (Mosbahi et al., 2016b). This ecosystem has long been recognized as one of the most important areas for migratory water birds during winter via the Mediterranean (Hamza et al., 2015). The islands are colonized by the seagrass Zostera noltei, protected species listed in the "IUCN Red List" of threatened species in Mediterranean Sea, as characterizing a diversified habitat requiring monitoring and protection (Mosbahi et al., 2016a). The Kneiss Islands were declared as a "Nature Reserve" in 1993, then as a "Specially Protected Area of Mediterranean Importanc" (SPAM) in 2001, an "Important Bird Area" (IBA) in 2003 and a "RAMSAR Site" in 2007 (Mosbahi et al., 2016a). However, this coast is subject to degradation and loss of biodiversity caused by bottom-trawling fishing (M’Rabet, 1995) and pollution due to the important industrial development linked to the phosphate treatment (Rekik et al., 2012), as well as maritime discharges rendering the harbour environment hostile for native species and opening a window for the proliferation of opportunistic exotic species and impacting marine systems and changing the structure and functioning of communities (Galil, 2000). Mosbahi et al. (2015, 2016ab) presented research investigate the seasonal and spatial structure of the intertidal macrozoobenthic communities of the area around the Kneiss Islands. However, data concerning the spatial and seasonal distribution of phytoplankton assemblages in the Kneiss Island coast were scarce. Our objective was 1) to investigate the structural diversity of the planktonic phytoplankton through summer 2009 and summer 2010; 2) to identify the role of the main abiotic factors that determine the phytoplankton community structure and functioning; and 3) to study the summer spatial distribution of phytoplankton in relation to its potential predators such as ciliate and zooplankton. To the best of our knowledge, there have been no previous comprehensive field studies that include all of the same parameters found in our study. The Kneiss Islands, located in the south-easternTunisia, between latitudes 34°10’-34°30’N and longitudes 10°-10°30’E (Mosbahi et al., 2015). The total surface-area of the archipelago (22.027 ha) can be divided into two main sectors: the subtidal channels and the intertidal areas (Bali and Gueddari 2011). 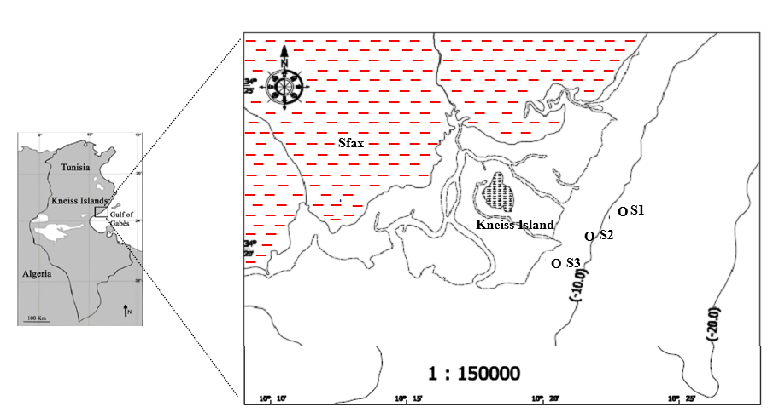 The mudflats of the Kneiss Islands are composed by muddy to sandy muddy sediments (Bali and Gueddari 2011). The tides are semidiurnal, attaining a range of 2.3 m during spring tides (Sammari et al., 2006). At low tide, the Kneiss Islands are surrounded by vast mud and sand flats (Abdennadher et al., 2010). The Kneiss archipelago is composed of four islands (Bessila island, Hajer island, Laboua island and Gharbia island). The three sampling stations are close to Bessila island and far from the others. The distance between the stations: S1- S2 and S2- S3 was 2 Km and between S1- S3 was 4 Km. The stations S1 (< 10 m), S2 (< 10 m) and S3 (> 10 m) were under different depths due to different distances of the coast. Nutrients, phytoplankton, ciliate and zooplankton samples were collected in July 2009 and July 2010. Water samples were collected on 3 stations around the Kneiss Islands coast (Figure 1). Seawater samples for physico-chemical analyses, phytoplankton and ciliate examination were collected from the surface water with a Van Dorn-type closing bottle at each station. Zooplankton was collected using a cylindro-conical net (30 cm aperture, 100 cm high, and 100 μm mesh size). Nutriment samples (120 mL) were stored immediately in the dark at 20 °C. Phytoplankton samples (1 L) were preserved with Lugol iodine solution (4%) for enumeration (Bourrelly, 1985). Zooplankton samples were preserved in 2% buffered formaldehyde solution and were stained with rose Bengal to facilitate dissection. Plankton samples were kept at low temperature (4 °C) in the dark until analysis. Physical parameters (temperature, salinity, and pH) were measured immediately after sampling using a multi-parameter kit (Multi 340 i/SET). Suspended matter concentrations were measured using the dry weight of the residue after filtration of 0.5 L of seawater onto Whatman GF/C membrane filters. Chemical parameters (nitrite, nitrate, ammonium, orthophosphate, silicate, total nitrogen and total phosphate) were analyzed with a Bran and Luebbe type 3 autoanalyzer. The N/P ratio was calculated from DIN (DIN= NO2- + NO3- + NH4+) to DIP (DIP= PO43-). For phytoplankton, ciliate and zooplankton analyses, there were three samples for each sampling station. Phytoplankton and ciliate samples (50 mL) were analysed under an inverted microscope after 24 to 48 h settling using the Utermöhl method (Utermöhl, 1958). Zooplankton enumeration was performed under a vertically mounted deep-focus dissecting microscope (Olympus TL 2). Plankton species identification was made according to various keys (Rekik et al., 2012; 2013ab; 2015abc). The data recorded in this study were submitted to a normalized principal component analysis (PCA) (Dolédec and Chessel 1989). Simple log (x+1) transformation was applied to data in order to correctly stabilize variance (Frontier, 1973). Means and standard deviations (SD) were reported when appropriate. The potential relationships between the biological (phytoplankton, ciliates and zooplankton) and the physicochemical parameters were tested with Pearson’s correlation coefficient. Also, Pearson’s rank correlation was performed to determine the correlations between the biotic variables. The results were illustrated by a dendrogram showing the steps in the hierarchical clustering solution and the values of the squared Euclidean distances between clusters. The mean values of physical variables recorded at the three sampled stations are summarised in Table 1. Temperature varied among stations and seasons (Table 1). The temperature was in the range 31 - 38 °C, the lowest values being observed at station 3 in summer 2009 and stations 1 and 3 in summer 2010. Salinity varied from 37.50 psu in summer 2010 at station 2 to 39 psu in summer 2009 at station 1. The mean salinity values showed a slight difference between the two-seasons (Table 1). The mean pH values ranged from 8.03 ± 0.06 (summer 2010) to 8.28 ± 0.13 (summer 2009) (Table 1). The mean pH values were usually alkaline, suggesting a more pronounced photosynthetic activity. Suspended matter concentration in summer 2010 (28.00-73.00 mg l-1) was lower than in summer 2009 (84.66-97.00 mg l-1) (Table 1). NO3- concentration varied between 1.38 and 2.77 µM in the study area, with the lowest concentration (1.38 µM) observed at station 3 in summer 2009, whereas the highest concentration (2.77 µM) value was observed in summer 2010 at station 3. The average values of NO3- concentration at both summer 2009 and 2010 were relatively close: 2.12 ± 0.64 and 2.65 ± 0.20 µM respectively (Student test, t=1.34; p=0.24; no significant difference) (Table 1). NO2- concentration was very low over the seasons and its mean values (0.59 ± 0.41 and 0.35 ± 0.24 µM) were detected in summer 2009 and 2010 respectively (Table 1). NH4+ concentrations were more available during summer 2010 (4.02 µM) than during summer 2009 (1.10 µM) (Table 1). NO3- and NH4+ concentrations were larger in summer 2010 than in summer 2009, whereas NO2- concentrations showed the opposite trend (Table 1). Total nitrogen (T-N) values were about 13 μM at both summer 2009 and 2010. Nitrogen appeared mainly in its dissolved organic form (71.86% (summer 2009) – 49.07% (summer 2010)) with the dissolved inorganic form (DIN = NO3− + NO2− + NH4+) representing only 28.14% in summer 2009 but 50.93% of the total nitrogen during summer 2010. The mean value of orthophosphate concentration was 0.29 µM, showed similar variations in both summer 2009 and 2010 (Table 1). When considering total phosphate concentrations, values were, 8 times that of orthophosphate concentration in the summer 2009 and up to 21 times in the summer 2010 (Table 1). The N/P: ratio mean value was about 17 (summer 2009) and 24 (summer 2010). This average was more important than the Redfield ratio (16), suggesting a potential phosphate limitation. Silica concentration was more important in summer 2010 (12.05 ± 1.23 µM) than in summer 2009 (4.95 ± 2.48 µM) (Table 1). The highest concentration of Si(OH)4 was recorded at station 3 during summer 2010 (13,45 µM), and the lowest (2,46 µM) at station 1 in summer 2009. In the present study, 50 phytoplankton taxa were observed, 24 identified to the species level. Diatoms were the richest group with 24 taxa, followed by dinoflagellate with 23 taxa. The genus Protoperidinium (8 species) was the most diverse among dinoflagellates and the genus Grammatophora and Nitzschia (2 species) among diatoms (Table 2). 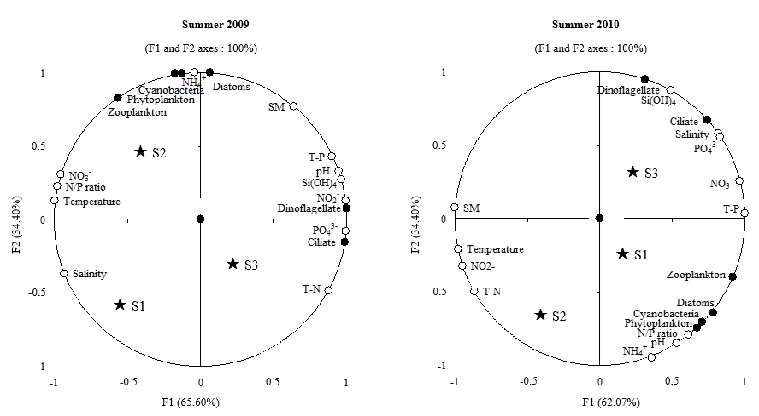 During the investigated period, the important phytoplankton abundance was recorded in summer 2010 (Student test, t=1.29; p=0.26; no significant difference). The highest (128 × 102 cells l-1) abundance value was observed during summer 2010, while the lowest (11 × 102 cells l-1) during summer 2009 at station 1 (Table 1). Cyanobacteriae abundance varied from 102 to 44 × 102 cells l-1 8.67 to 18.33 × 102 cells l-1, exhibiting their highest abundance in summer 2010, and the lowest in summer 2009. 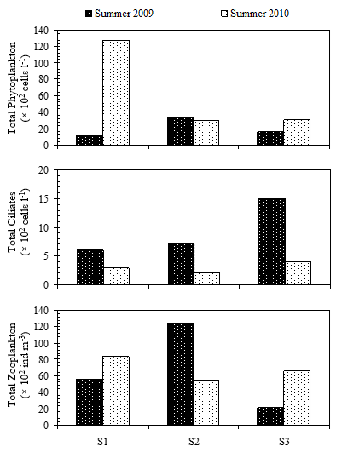 Overall, cyanobacteriae showed high abundance distributions in station 2 (summer 2009) and 1 (summer 2010) (Fig. 2). Diatoms abundance ranged from 3.50 to 74 × 102 cells l-1 (mean ± SD = 19.08 ± 27.33 × 102 cells l-1 for the study period), showing a remarkable increase in summer 2010 (mean ± SD = 34.00 ± 34.64 × 102 cells l-1) ascribed to the high abundance of different diatoms species including Navicula sp. (maximal abundance = 28 × 102 cells l-1 at station 1, summer 2010), Fragilaria sp. (maximal abundance = 103 cells l-1 at station 1, summer 2010), Nitzschia longissima and Rhabdonema sp. (maximal abundance = 6 × 102 cells l-1 at station 1, summer 2010) respectively. The highest (12 × 102 cells l-1) dinoflagellates abundance was observed in summer 2010 at station 3 and the lowest (6.50 × 102 cells l-1) in summer 2009 at station 1. Dinoflagellates mean abundance per season increased in summer 2010 (10.67 ± 1.15 × 102 cells l-1) and reached its maximum in summer 2009 (7.17 ± 0.76 × 102 cells l-1), varying significantly from year to year, and among sampling sites (Fig. 2). Dinoflagellates diversity varied significantly with respect to seasons, decreasing in summer 2010 (10 species) and exhibiting a remarkable increase in summer 2009 (16 species) (Table 2). Small dinoflagellates (6 species) consisted of different Prorocentrum such as P. gracile, P. lima, P. micans, P. rathymum and P. triestinum and the genera of Peridinium. Medium-size dinoflagellate (14 species) was essentially represented by different Protoperidinium (P. curvipes, P. depressum, P. divergens, P. ovatum, P. ovum, P. pyriforme and P. steinii), Scrippsiella trochoidea, Amphidinium sp. and Gymnodinium sp., although other taxa such as Pyrophacus sp., Akashiwa sanguineum and Polykrikos kofoidii were also observed. Large dinoflagellates (3 species) comprised the genera Ceratium (Table 3). The spatial and annual distribution of phytoplankton abundance with the prevailing potential predators (total ciliate and zooplankton) is illustrated in Figure 3. The abundance of ciliate (dominated by the Tintinnid which accounted for 45 - 75% of total ciliate abundance) showed significant correlations between abundance of ciliate and dinoflagellates for both years (r = 0.97, n = 18, p = 0.05, summer 2009) and (r = 0.87, n = 18, p = 0.05, summer 2010). The abundance of phytoplankton was correlated with that of zooplankton (dominated by copepod with percentages varying between 45 – 84%). Cyanobacteriae were positively correlated to zooplankton abundance, (r=0.89, n=18, p<0.05) and (r=0.90, n=18, p<0.05), during summer 2009 and 2010 respectively. Highly significant correlations were found between diatoms and zooplankton abundance (r=0.79, n=18, p<0.05, summer 2009) and (r=91, n=18, p<0.05, summer 2010) (Fig. 3). PCA allowed discrimination of four groups around the components of the F1 and F2 axes (Fig. 4), explaining 100 % of the variance. The F1 axis, explaining 65.60 % of the variability of abiotic and biotic parameters, positively selected group G1 composed of pH, suspended matter, NO2−, T-P, Si (OH)4, diatoms and dinoflagellates. The F2 axis, representing 34.40 % of the variability, positively selected group G2 comprising chemical factors such as PO43− and T-N correlated with ciliate concentrations. G3 comprised salinity. The group G4 was formed by phytoplankton, cyanobacteriae and zooplankton together with temperature, NO3−, NH4+ and N/P ratio (Fig. 4). This combination was selected in summer 2009. In summer 2010, the PCA distinguished between four groups surrounding the F1 and F2 component axes thus explaining 100 % of the variance. The axes selected a group G1 comprising the biological parameters (Dinoflagellates and ciliates) and several physico-chemical variables (salinity, NO3-, PO43-, T-P and Si(OH)4). F1 component axis, which extracted 62.07 % of the variability, selected positively the group G2, with phytoplankton, cyanobacteriae, diatoms and zooplankton correlating to abiotic parameters (pH, NH4+ and T-N). The gradient along the F1 axis is mainly due to temperature, NO2- and T-N (selected negatively in G3) and to suspended matter (selected negatively in G4) (Fig. 4). Figure 5 displays results of hierarchical clustering and the resulting dendrogram. The dendrogram from the cluster analysis emphasizes 2 natural groupings. It was possible to define the locations into two groups determined at 35 % dissimilarity of the physicochemical parameters during both summer 2009 and 2010. Cluster 1 groups the stations. This combination was selected in summer 2009. During summer 2010, another cluster with a group formed by stations 1 and 3. 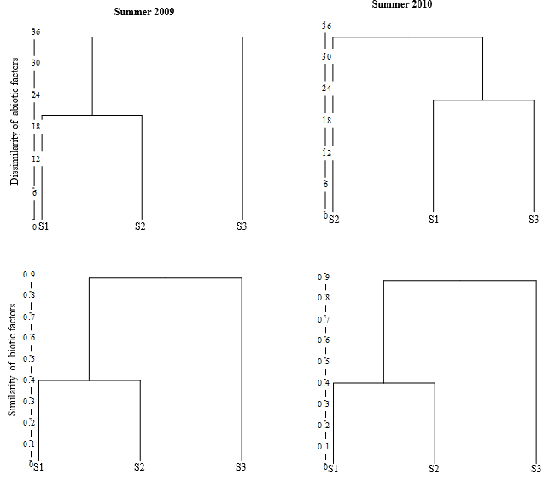 The dendrogram of similarity determined two groups for biotic variables in summer 2009 and 2010. Cluster formed by stations 1 and 2 for both summer 2009 and 2010. The present study is the first examining the spatial distribution of phytoplankton assemblage in the shallow coastal waters around Kneiss Islands coupling to nutrients, ciliate and zooplankton abundance during summer 2009 and 2010. Our results demonstrated distinct inter-annual contrasts differences. Phytoplankton assemblages in coastal ecosystems are controlled by a combination of environmental and biological factors. As it is well known from other research works, some environmental parameters seem to play an important role in determining the phytoplankton community diversity and abundance, favouring or limiting the growth of the different phytoplankton groups (Song et al., 2004). The recorded values of temperature and salinity agree with and complement other studies performed in arid to semi-arid Mediterranean areas (Elloumi et al., 2015). Temperature was homogeneous, which is consistent with the shallowness of the seawater layer. The alkaline pH values can be explained by an important photosynthetic activity. Indeed, the phytoplankton fixes the CO2 for photosynthetic activity. The CO2 forms carbonic acid which reduce the pH. Its consumption by phytoplankton therefore increases the pH of the ecosystem (Hamza, 2003). A striking difference among years is seen in suspended matter concentrations with lower values in summer 2010 (47.37 ± 23.12 mg l-1), contrasting with the higher suspended matter values in summer 2009 (92.88 ± 7.15 mg l-1). The high suspended matter concentrations levels can reasonably be attributed to the degradation of macroalgue and high levels of organic and inorganic particulates from different anthropogenic effluents (Bonsdorff et al, 1997). The average value of the N/P ratio (16.55) was relatively close to the Redfield ratio (16) in summer 2009. Contrasting with the results we found in summer 2009, the average value of the N/P ratio was more important to the Redfield ratio (16) in summer 2010. However, large variations in the N/P ratio were observed (Table 1) due to the direct influence of the variability in concentration of both the N and P components of the ratio. This was possibly due to phytoplankton’s rapid consumption (Rekik et al., 2016a) and the importance of N availability may be caused by atmospheric deposition (Liu et al., 2015). The fluctuation in nutrient concentration between years was primarily due to the inputs of nutrients from the deep layer and to local anthropogenic factors (Rekik et al., 2015c). The study found a total of 50 phytoplankton taxa of three different algal classes which compares with several previous studies conducted on the north coast, with 70 phytoplankton species (Rekik et al., 2013a) and south coast of Sfax with 78 phytoplankton taxa (Rekik et al., 2015c). A comparison with previous work (Rekik et al., 2013a, 2015c) revealed a more or less similar phytoplanktonic composition with the three dominant classes (cyanobacteriae, diatoms and dinoflagellates) but in different relative abundances. Our study explained two key results: (i) in summer 2010, the phytoplankton abundance was about 3 times that in summer 2009, (ii) a high abundance of cyanobacteriae (43 % of total phytoplankton) and diatoms (54 % of total phytoplankton) in summer 2009 and 2010 respectively. In summer 2009, we observed a cyanobacteriae growth with dominant opportunistic and nitrogen-fixing Oscilatoria sp. which, at first sight, might be an eutrophication indicator (Table 1 and Table 2) (Ye et al., 2012). But, in other studies, authors have found the same pattern with the cyanobacteriae dominating the phytoplankton community forming colonies during summer in the oligotrophic Baltic Sea (Nausch et al., 2008). Cyanobacteriae proliferation started in summer 2009 when dissolved inorganic phosphate was low. This result is in agreement with that of Rekik et al. (2013a) in north coast of Sfax after restoration. Cyanobacteriae abundance may have also been favored by the presence of a high concentration of suspended matter (r=0.69, n=18, p<0.05) inducing low water transparency (Wang et al., 2007) and the capacity of Oscilatoria sp. blooms to collect dust particles (Rubin et al., 2011) essential for the high iron demand in Oscilatoria sp. to ensure important photosynthesis (Roe et al., 2012). Diatoms are valuable indicators of ecological quality as they react directly and sensitively to many nutrients concentrations variations in marine environment (Davies, 2013). Our results showed an increase of diatoms abundance in summer 2010 with the maximum (74 × 102 cells l-1) was reached in station 1. In particular, nitrogen seemed to be the most important factors in the coastal environments which may influence the spatial distribution of diatoms. Diatoms abundance was correlated with NH4+ concentrations (r=0.99, n=18, p<0.05). Ammonia is a source of nitrogen and participates to the fertility of water since nitrogen is an essential plant nutrient (Feki et al., 2016). The fact that nutrients have the greatest influence on diatoms abundance in our study area is clear from the strong positive correlation between their abundance and total phosphate (r=0.64, n=18, p<0.05) and N/P ratio (r=0.98, n=18, p<0.05). Dominance of the benthic and large diatoms genus such as Navicula and Nitzschia (Table 2) (Welker et al., 2002) has been already reported in other studies (Feki-Sahnoun et al., 2014). These diatoms species are also found in Kerkennah islands (Ben Brahim et al., 2015a), in the north (Rekik et al., 2013a, 2015a) and south (Rekik et al., 2015c) coast of Sfax and the Gulf of Gabes (Feki-Sahnoun et al., 2014). Benthic and large diatoms are identified by its opportunistic strategy as far as taking advantage of the nutrient accessibility is concerned (Aleya 1992). Concerning dinoflagellates, they were strongly abundant in summer 2009 (36 % of total phytoplankton abundance) than summer 2010 (17 % of total phytoplankton abundance), as repeatedly reported in the Gulf of Gabes (Feki-Sahnoun al., 2013) and in other Mediterranean marine ecosystems (Anderson et al., 2012). Dinoflagellates are ubiquitous in marine environments. They are also very abundant in southern Tunisia as found by Bel Hassen et al. (2008) who proved that the small phytoplankton was the major contributors to the autotrophic abundance. An important number of dinoflagellates species in marine phytoplankton are deprived of chloroplasts (Sherr and Sherr 2007). The percentage of Mixotrophic and heterotrophic dinoflagellates in total dinoflagellates abundance was higher 49 % (summer 2009) - 56 % (summer 2010). Some mixotrophic and heterotrophic dinoflagellates species, like Polykrikos kofoidii, Ceratium lineatum, Protoperidinium steinii, Protoperidinium depressum, Protoperidinium curvipes, Protoperidinium divergens, attained high numbers in our coastal area. Similar observation was shown by Ltaief et al. (2015) in the Gulf of Gabes where important proliferation of heterotrophic and mixotrophic dinoflagellates was the distinctive characteristic of the summer cruise. Mixotrophic and heterotrophic Protoperidinium species had the potential to consume 30% – 80% (Gribblel et al., 2007) of autotrophic dinoflagellates (Jeong et al., 2010) and diatoms (Sherr and Sherr 2007). In general, food availability may be the most essential factor regulating seasonal dynamics of mixotrophic and heterotrophic dinoflagellates abundance (Ben Brahim et al., 2015b). Mixotrophic and heterotrophic dinoflagellates species may be in competition with zooplankton to feed on autotrophic dinoflagellates and diatoms. Our investigation showed that ciliate abundance was low in summer 2010, revealing a probable predation by mixotrophic and heterotrophic dinoflagellates and zooplankton (Jeong et al., 2010). Zooplankton seems to be dependent probably on their capacity to exploit a wide range of food resources including phytoplankton and ciliate (Rekik et al., 2015c). Zooplankton is able to complete a top-down control on phytoplankton and ciliate communities (Zervoudaki et al., 2007). On the other hand, the genus Protoperidinium is known by feeding exclusively on diatoms (Sherr and Sherr 2007). Thus mixotrophic and heterotrophic dinoflagellates is in direct feeding competition with ciliate and zooplankton (Sherr and Sherr 2007). This competition may constitute another hypothesis explaining the simultaneous presence of mixotrophic and heterotrophic dinoflagellates, ciliate and zooplankton and the correlations recorded between them. This work was supported by the Taparura Project conducted in the Biodiversity and Aquatic Ecosystems UR/11ES72 research unit at the University of Sfax. Figure 1. Location of sampling stations on the Kneiss islands. Figure 2. Spatial and annual variations of phytoplankton abundance groups: cyanobacteriae, diatoms and dinoflagellates in the Kneiss islands. Figure 3. Spatial and annual variations of the abundance of phytoplankton, ciliates and zooplankton in the Kneiss islands. Figure 4. Principal component analysis (Axis I and II) of biological parameter abundance and selected environmental variables at sampled stations in the Kneiss islands. Figure 5. Cluster analysis showing the dissimilarity among stations of abiotic and biological variables in the Kneiss islands. Table 1. Minimum, maximum and mean ± SD of physical-chemical and biological variables on the Kneiss islands during summer 2009 and summer 2010. Table 2. List of the phytoplankton species observed in summer 2009 and summer 2010 at sampled stations in the Kneiss islands. Black symbol: species detected, White symbol: species not detected. Jeong HJ, Yoo YD, Kim JS, Seong KA, Kang NS, Kim TH (2010). "Growth, feeding and ecological roles of the mixotrophic and heterotrophic dinoflagellates in marine planktonic food webs." Ocean Science Journal 45: 65-91. Hamza F, Hammouda A, Selmi S (2015). "Species richness patterns of waterbirds wintering in the gulf of Gab?s in relation to habitat and anthropogenic features." Estuarine, Coastal and Shelf Science 165: 254-260. Hamza A (2003). "Le statut du phytoplancton dans le Golfe de Gab?s". Th?se de Doctorat en sciences biologiques. Facult? des sciences de Sfax. INSTM. Gueddari M, Oueslati A (2002). "Le site de Kneiss, Tunisie: g?omorphologie et aptitudes ? l'am?nagement. In: Recherche de Base pour une Gestion Durable des Ecosyst?mes Sensibles C?tiers de la M?diterran?e." (F. Scapini, ed), Istituto Agronomico per l'Oltremare : Italie, p. 63-71. Gribblel KE, Nolan G, Anderson DM (2007). "Biodiversity, biogeography and potential trophic impact of Protoperidinium spp. (Dinophyceae) off the southwestern coast of Ireland." Journal of Plankton Research 29: 931-47. Galil BS (2000). "A sea under siege: alien species in the Mediterranean." Biological Invasions 2: 177-186. Feki M, Brahim MB, Feki-Sahnoun W, Mahfoudi M, Sammari C, Hamza A (2016). "Seasonal and daily fluctuation of dinoflagellates during spring tide periods in Kerkennah Islands (Southern coast of Tunisia)." Life and Environment 66: 1-12. Feki-Sahnoun W, Hamza A, Mahfoudi M, Rebai A, Bel Hassen M (2014). "Long-term microphytoplankton variability patterns using multivariate analyses: ecological and management implications." Environmental Science and Pollution Research : DOI: 10.1007/s11356-014-3009-2. Feki-Sahnoun W, Hamza A, Frossard V, Abdennadher M, Hannachi I, Jacquot M (2013). "What are the potential drivers of blooms of the toxic dinoflagellate Karenia selliformis? A 10-year study in the Gulf of Gabes, Tunisia, southwestern Mediterranean Sea." Harmful Algae 23: 8-18. Dol?dec S, Chessel D (1989). "Rythmes saisonniers et composantes stationnelles en milieu aquatiqueII. Prise en compte et ?limination d'effets dans un tableau faunistique." Acta oecologica Oecologia generalis 10: 207?332. Bourrelly P (1985). "Introduction to systematic. Volume II. The blue and red algae." Paris: Edit? par Soci?t? Nouvelle des Editions Boub?e; p. 450. Davies OA, Ugwumba OA (2013). "Tidal influence on nutrients status and phytoplankton population of Okpoka Creek, upper Bonny Estuary, Nigeria." Journal of Marine Biology : DOI: 10.1155/2013/684739. Bonsdorff E, Blomqvist E, Mattila J, Norkko A (1997). "Long term changes and coastal eutrophication. Examples from the Aland Island and the Archipelago Sea, northern Baltic Sea." Oceanologica Acta 20: 319?329. Ben Salem Z, Drira Z, Ayadi H. What factors drive the variations of phytoplankton, ciliate and mesozooplankton communities in the polluted southern coast of Sfax, Tunisia? Environ Sci Pollut Res 2015; doi: 10.1007/s11356-015-4416-8. Ben Ltaief T, Drira Z, Hannachi I, Bel Hassen M, Hamza A, Pagano M (2015). "What are the factors leading to the success of small planktonic copepods in the Gulf of Gabes, Tunisia?" Journal of the Marine Biological Association UK 95: 747?761. Ben Brahim M, Feki M, Feki-Sahnoun W, Mahfoudi M, Hamza A (2015b). "Factor driving heterotrophic dinoflagellate in relation to environment conditions in Kerkennah Islands (eastern coast of Tunisa)." Journal of Coastal Life Medecine 3: 930-4. Ben Brahim M, Feki-Sahnoun W, Feki M, Mahfoudi M, Hamza A (2015a) "Seasonal and daily fluctuation of diatoms during spring tide periods in Kerkennah Islands." Journal of Coastal Life Medecine 3: 446-452. Bel Hassen M, Drira Z, Hamza A, Ayadi H, Akrout F, Issaoui H (2008). "Summer phytoplankton pigments and community composition related to water mass properties in the Gulf of Gabes." Estuarine, Coastal and Shelf Science 77: 645?656. Bali M, Gueddari M (2011). "Les chenaux de mar?e autour des ?les de Kneiss, Tunisie: s?dimentologie et ?volution." Hydrological Sciences Journal 56: 498-506. Aleya L (1992). "The seasonal succession of phytoplankton in a eutrophic lake through the coupling of biochemical composition of particulates, metabolic parameters and environmental conditions." Archiv fur Hydrobiologie 124: 69-88. Liu X, Huang B, Huang Q, Wang L, Ni X, Tang Q (2015). "Seasonal phytoplankton response to physical processes in the southern Yellow Sea." Journal of Sea Research 95: 45-55. Mosbahi N, Boudaya L, Dauvin JC, Neifar N (2015). "Spatial Distribution and Abundance of Intertidal Benthic Macrofauna in the Kneiss Islands (Gulf of Gab?s, Tunisia)." Cahiers de Biologie Marine 56: 319-328. Mosbahi N, Pezy JP, Dauvin JC, Neifar L (2016a). "Short-Term Impact of Bait Digging on Intertidal Macrofauna of Tidal Mudflats around the Kneiss Islands (Gulf of Gab?s, Tunisia)." Aquatic Living Resources 28: 111-118. Mosbahi N, Pezy JP, Dauvin JC, Neifar L (2016b). "Spatial and Temporal Structures of the Macrozoobenthos from the Intertidal Zone of the Kneiss Islands (Central Mediterranean Sea)." Open Journal of Marine Science 6: 223-237. M'Rabet R (1995). "Les engins de p?che et les ressources halieutiques." Notes de l'Institut National Scientifique et Technique d'Oc?anographie et de P?che de Salammb? 6: 1-29. Rekik A, Maalej S, Ayadi H, Aleya L (2013a). "Restoration impact of an uncontrolled phosphogypsum dump site on the seasonal distribution of abiotic variables, phytoplankton and zooplankton along the near shore of the south-western Mediterranean coast." Environmental Science and Pollution Research: DOI: org/ 10.1007/s11356-012-1297-y. Rekik A, Denis M, Maalej S, Ayadi H (2015a). "Spatial and seasonal variability of pico-, nano- and microphytoplankton at the water-sediment interface in the north coast of Sfax, Eastern Mediterranean Sea." Environmental Science and Pollution Research: DOI: 10.1007/s11356-015-4811-1. Rekik A, Denis M, Maalej S, Ayadi H (2015b). "Planktonic ciliates in relation to abiotic variables on the north coast of Sfax after environmental restoration: species composition, and abundance-biomass seasonal variation." Journal of oceanography, research and data 8: 1-16. Rekik A, Elloumi J, Charri D, Ayadi H (2015c). "Phytoplankton and ciliate communities' structure and distribution in a stressed area of the south coast of Sfax, Tunisia (Eastern Mediterranean Sea)." Marine and Freshwater Research: DOI: org/10.1071/MF15057. Rekik A, Ben Salem Z, Ayadi H, Elloumi J (2016). "Spring phytoplankton variability along a south coast of Sfax at the water-sediment interface (Tunisia, Eastern Mediterranean Sea)." Journal of Coastal Life Medicine 4: 121-127. Rubin M, Berman-Frank I, Shaked Y (2011). "Dust and mineral iron utilization by the marine diazotroph Trichodesmium." Nature Geoscience 4: 529-534. Sammari C, Koutitonsky VG, Moussa M (2006). "Sea level variability and tidal resonance in the Gulf of Gab?s, Tunisia." Continental Shelf Research 26: 338-350. Sherr EB, Sherr BF (2007). "Heterotrophic dinoflagellates: a significant component of microzooplankton biomass and major grazers of diatoms in the sea." Marine Ecology Progress Series 352: 187-197. Uterm?hl H (1958). "Toward the improvement of the quantitative phytoplankton method". Deutsch, Mitteilungen Int Vereiningung Limnology: 1-38. Welker C, Sdrigotti E, Covelli S, Faganeli J (2002). Microphytobenthos in the Gulf of Trieste (Northern Adriatic Sea): relationship with labile sedimentary organic matter and nutrients. Estuarine, Coastal and Shelf Science 55: 259-273. Ye Y, Christophe V?lker C, Bracher A, Taylor B, Dieter A (2012). "Environmental controls on N2 fixation by Trichodesmium in the tropical eastern North Atlantic Ocean?a model-based study." Deep-Sea Research Part I: DOI:10.1016/ j.dsr.2012.01.004. Zervoudaki S, Christou ED, Nielsen TG, Siokou I, Frangou G, Assimakopoulou G, Giannakourou A (2007). "The importance of small-sized copepods in a frontal area of the Aegean Sea." Journal of Plankton Research 29: 317-338.